2. Place the onions, canola oil and butter in a large pot. Cook over medium-high heat until the onions start to brown and caramelize. Season with salt and pepper. 3. Pour the cooked onions into a large ovenproof dish. Lay them out on the bottom of the dish in an even layer. 4. 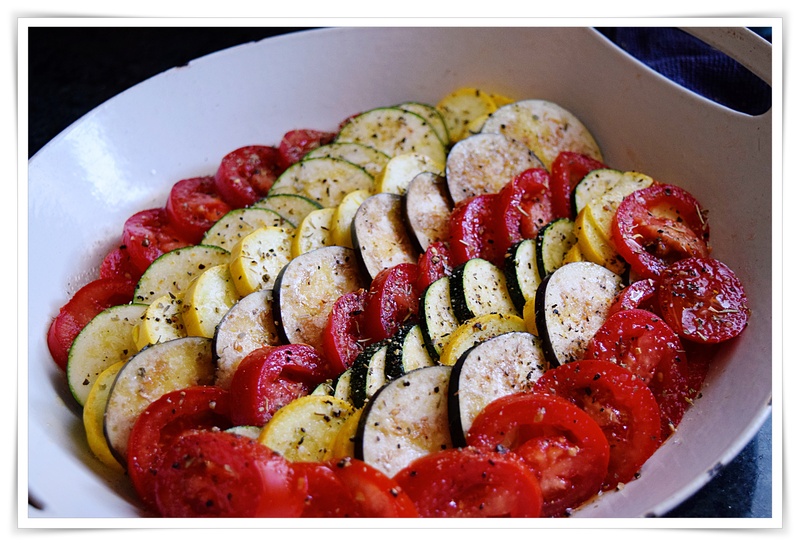 Fan out each vegetable in rows alternating tomatoes, zucchini, squash, and eggplant all the way down the dish until the dish is covered with the vegetables. Drizzle the olive oil over the top and season with salt and pepper. Sprinkle the thyme leaves on top. 5. Bake in the oven for 20 to 30 minutes, or until the vegetables are tender. 6. Serve the byaldi in the middle of the table, family style.